a measure of internal forces that arise in a body being deformed as a result of external forces. When studying the stress at any point, a section is cut through the point (Figure 1). The interaction of contiguous parts of the body along the section is replaced by forces. If a force ∆P acts on the elementary area ∆S surrounding point M, the limiting value of the quotient lim (∆P/∆S) ═ ⍴ is called the stress at the point M on the surface ∆S; it is a vector quantity. The components of the vector of stress are the normal stress σ along the normal to the section and the tangential stress τ, in which case ⍴2 ═ σ2 + τ2. The totality of vectors of stress for all sections cut through point M characterizes the stressed state at the point. 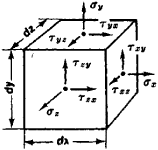 The stressed state is completely defined by the tensor of stresses, whose components σx, σY, σZ, τxy ═ τyx, τyz ═ τzy, and τzx ═ τxz are precisely the stresses on the faces of an infinitely small parallelipiped formed in the vicinity of the given point (Figure 2). The relationship between stress and deformations is described by relationships of elasticity theory within the elasticity limits of the material. 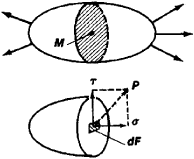 Equations of plasticity theory apply in the elastoplastic state. Experimental studies of stress are conducted using the method of tensometry (strain measurement), as well as optical methods (for example, the optical polarization method of stress study). The system uses an adhesive technology which decreases thermal and mechanical stress on the cells. The failures have been blamed on certain increased heat conditions associated with specific pump drive commands and mechanical stress on the control module, located underneath the rear seat. Often operating in harsh conditions such as high winds and storms and in remote locations, HBM says its measurement technology helps to identify mechanical stress on wind turbine components at an early stage, subsequently minimising potential downtime. During cultivation and harvest, oysters are submitted to mechanical stress through size sorting and cleaning of epibionts, but are also maintained out of seawater and are exposed to sunlight during cleaning and transport to marketplaces, taking from minutes to hours. The expanding volume is used to impose mechanical stress on a magneto-elastic alloy, changing its magnetic properties in ways that can be detected wirelessly. The new ie3 premium efficiency gearmotors offer increased efficiency over standard IE1 models throughout the speed range and initiate less mechanical stress, which directly translates into long-term energy savings. In both instances, the results showed an increase in bone formation and density without causing any mechanical stress to the construct or surrounding tissue. In piezoelectric materials, mechanical stress results in electrically charged materials. Intensive mechanical stress could cause micro-cracks to the card body structure. The cables are resistant to UV light, flames, steam, deionized water, acids, alcohol, autoclave, ozone, mechanical stress and many chemicals. Christ Basu, a PhD student in the Structure and Motion Lab said that giraffes were heavy animals but had unusually skinny limb bones for an animal of this size which means that their leg bones were under high levels of mechanical stress. Although mechanical stress is claimed for aetiology, but remains a dilemma for physicians. Condensing osteitis of the clavicle in a man: Any relationship with tooth decay?